Gorgeous Trogir is set within medieval walls on a tiny island, linked by bridges to both the mainland and to the far larger Ciovo Island. Trogir is a town on the central Adriatic coast of Croatia. Its preserved old town is known for its mix of Renaissance, baroque and Romanesque buildings. The 13th-century Cathedral of St. Lawrence houses the Renaissance Chapel of St. John and offers sweeping views from its bell tower. Parts of the medieval city walls remain intact. On summer nights everyone gravitates to the wide seaside promenade, lined with bars, cafes, and yachts, leaving the knotted maze-like marble streets gleaming mysteriously under old-fashioned streetlights. The old town has retained many intact and beautiful buildings from its age of glory between the 13th and 15th centuries. In 1997 its profuse collection of Romanesque and Renaissance buildings earned it World Heritage status. While it's easily reached on a day trip from Split, Trogir also makes a good alternative base to the big city and a relaxing place to spend a few days. 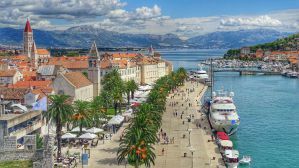 With all of these fabulous attributes, Trogir is a great place to visit, and, there are also some great, budget-friendly accommodations to use as a base for exploring. 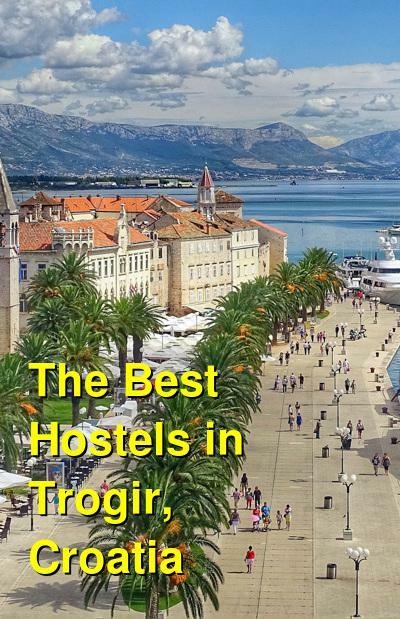 How much do hostels in Trogir cost? City Hostel is great choice if you want to stay in Trogir. The hostel offers free Internet access and wake-up service. Hostel's personnel is available 24 hours a day, and they can also help you organize picnics, tours and other different activities. The Hostel is located in a unique place in the heart of Trogir, on main square (St John II square), right across from the Cathedral of St. Lawrence. Conveniences like bars, restaurants, and markets can be found in the immediate vicinity of the City Hostel Trogir. Cathedral of St. Lawrence and Radovan's portal is just across City Hostel Trogir. In City Hostel guests can choose between different common rooms as well as bathrooms. All rooms offer air-conditioned accommodation and beside every bed is a jack and a night light. In the building area there is a salon with satellite TV and a restaurant which serves Dalmatian cuisine. Bedspreads, blankets and towels are free, and guests also have the access of hostel's safe. Hostel Oktarin is a new hostel located in Kastel Stafilic, between Split and Trogir, in a quiet location in front of the sea. A bus station and some grocery shops are very conveniently located nearby. The hostel's capacity is 24 persons; there are 4 cozy guest rooms equipped with lockable drawers under the bunk beds, table and chair, bedside lamps, ceiling fans, 1 double-bed room, 1 twin-bed room, washing machine, and a tumble dryer. The hostel has bathrooms and toilets segregated for women and men and a kitchen with traditional Dalmatian hearth. Set in the tranquil location of the Croatian coastal region of Dalmatia, Hostel Oktarin is immersed in nature with a terrace that overlooks lavender and rosemary groves, as well as palm and olive trees. There is a long, beautiful, uncrowded beach nearby, very popular for walking or jogging. Also, you can enjoy a game of football or play tennis on one of five tennis courts. Surround yourself with nature while enjoying the beautiful panoramic views, sunshine and elegant guest rooms at this inspiring Dalmatian location. Towels, linens, and parking are free with your stay. Hostel Marina is located in a building dating from the 50's, recently renovated, so that the guest feel comfortable. In the common room you will find a television with cable TV. The property offers access to a kitchen with microwave, refrigerator, a vending machine for coffee, tea and snacks, and you can also cook there. The hostel offers a free basic breakfast every morning to start your day right. Next door to the property is a small supermarket. Bakery, restaurants, and bars are also located in the immediate vicinity. All rooms are air-conditioned and some have views of the marina and the Riva of Trogir. Every bed has its own locker. Linens are included with your stay. The Goja Apartments offers four different apartments, situated just 250 meters from the beautiful beach. Each apartment has its own entrance, a double bedroom, a sitting room with small kitchen, dining room with sofa with one or two beds, large bathroom and a balcony that overlooks the sea. The building is situated in a quiet location in the pine-woods. A beautiful swimming pool is available in front of the house, with sun beds, a barbeque, and a big table at your disposal. The facility is a family-run establishment offering traditional hospitality in Trogir. The location gives you the opportunity for year-round relaxation, long walks, cycling through untouched nature, fishing, tennis, sailing, water-skiing, surfing, paragliding, or excursions to the nearby islands. The property is also only 2km away from the downtown area with its nightlife and many restaurants offering Mediterranean cuisine. You will also want to explore the old city with its many Romanesque and Renaissance buildings including the Cathedral of St. Lovro, Cipiko Palace and Kamerlengo Fortress. Airport pick up can be arranged with the facility if desired. Linens, towels, and parking are included with your stay.